Available now from Heatcraft Australia is the Sauermann OMEGA PACK Piston Pump Condensate Removal System with Si-20 Piston Mini-Condensate Pump. The popular OMEGAPACK incorporates the latest in piston pump technology achieving less runtime thanks to the highest flow rate on the market of up to 20 l/hr. A unique rubber damper specifically designed to reduce vibration transmission to the mini-split/wall allows the pump to operate with the most silent operation on the market. The OMEGAPACK can be installed on any wall mounted air conditioning unit. The Si-20 is available as a replacement or a stand-alone unit. Complete installation kit and pre-mounted pieces. Reversible. Can be fitted on the right or left of any wall mounted mini-split air conditioning unit. Can be installed on any surface (brick, plaster, wood, etc.). “Drain Safe Device” aids connection to the discharge pipe. No filter. Design to allow free passage of particles up to 2 mm. Highest flow of the market - Up to 20ltr/hr = Less run time. The Drain Safe Device retains prime and prolongs the pump life. Stand-alone pump available. Order Code: Si-20. To order your Sauermann OMEGAPACK click through to smart access or contact your nearest Heatcraft branch on 13 23 50. WorldSkills Australia team excel at the "Tradie Olympics"
WorldSkills Australia Gold Sponsor, Heatcraft Australia congratulates WorldSkills Australia Refrigeration and Air Conditioning Skillaroo, Nathan McHugh on his Medallion of Excellence at the 44th WorldSkills International competition in Abu Dhabi. The outstanding performances of the 2017 ‘Skillaroos’ and their experts have propelled WorldSkills Australia into the top 10 skill nations in the world. The final medal tally from the International 4 day event included 2 Silver Medals in the Carpentry & Industrial Mechanic Millwright categories, 2 Bronze Medals in the Bricklaying & Beauty Therapy categories and 11 Medallions of Excellence, of which Nathan McHugh (pictured below) was awarded one for his individual performance in the Refrigeration & Air-Conditioning Category. The Medallion of Excellence is awarded to those competitors who achieve above-average scores in their contest areas. Nathan McHugh is employed in the family business DTM Air Services, located in Brisbane and attends TAFE Queensland SkillsTech. Nathan followed his father’s footsteps into his trade, spending countless hours as a kid watching his dad work. He recently started a second apprenticeship to become dual-qualified in Refrigeration and Airconditioning and Electrical. 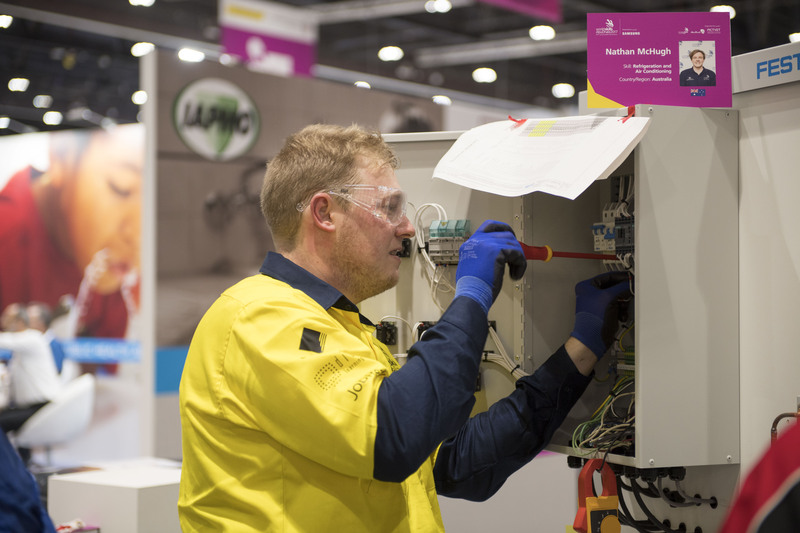 WorldSkills Australia selected a team of 43 Australian tradespeople and their mentors in July to represent their country at the international competition that comprised 3000 participants including competitors, experts, and officials, from 77 countries competing in 51 skills. WorldSkills Australia Chief Executive Officer Brett Judd said that the individual performances of every team member were commendable which ultimately contributed to an outstanding and extremely pleasing overall team result. “We saw amazing performances from our Australian team with 14 of the 17 finishing in the top 10 and receiving the coveted Medallion of Excellence. This is, of course, topped off with 4 exceptional medal performances, ensuring Australia continues to build our reputation on the international stage,” Judd said from Abu Dhabi. “These 18 young, talented individuals prepared themselves to compete against the best the world has to offer with great professionalism and commitment to their respective skills and the results we achieved collectively were a testament to that preparation and everyone associated with the are incredibly proud. For more information on WorldSkills Australia, visit https://www.worldskills.org.au/. Heatcraft Australia is a proud Gold Sponsor of WorldSkills Australia. In 2016, Heatcraft celebrated 20 years of partnership with WorldSkills Australia. Introducing the all NEW CPS ABM Air Capture Hood. The ABM Easy Hood captures airspeed values from air supply or return/exhaust grilles in residential or commercial buildings and easily converts that into an airflow volume reading. To accomplish this, the ABM Easy Hood is used with an ABM-200 Airflow & Environmental Meter (or ABM-100 Airflow Meter) and a smartphone having the latest, free, CPS Link app installed. To order your CPS ABM-HOOD-200 Easy Hood click through to smart access or contact your nearest Heatcraft branch on 13 23 50. Heatcraft Australia supports the Australian Government’s commitment to phase-down the production and usage of hydrofluorocarbons (HFCs). Australia has become one of the first 10 countries to ratify the Kigali Amendment to the Montreal Protocol, a major international agreement to reduce global production and use of hydrofluorocarbons (HFCs) which are highly potent synthetic greenhouse gases. This early ratification cements the leading role Australia played in reaching this agreement, including as the co-chair of the negotiations which concluded in October 2016. Under the Kigali Amendment, Australia and other developed countries will reduce the use of HFCs by 85 per cent by 2036. Action to phase-down HFCs will contribute towards meeting Australia’s responsible Paris Agreement target of reducing emissions by 26 to 28 per cent on 2005 levels by 2030. The Turnbull Government has already passed legislation to implement this phase-down domestically. Australia’s imports of HFCs will start reducing in 2018 over a gradual step-down path until 2036. The long phase-down period means that consumers can continue to use equipment with HFCs until the end of its useful life. There are already new technologies on the market which use fewer HFCs or different technologies altogether. The Kigali Amendment replicates the successful approach taken under the Montreal Protocol to phase out ozone depleting substances, 99 per cent of which have been phased out to date. This has seen a significant reduction of those substances in the atmosphere and predictions that the ozone layer will be repaired by the middle of this century in the mid-latitudes and about 20 years later in Antarctica. Australia has long been a strong supporter and leader of action on the ozone layer under the Montreal Protocol. With universal acceptance, it is widely considered the world’s most successful environmental protection agreement. NEW to the Heatcraft range is the Rectorseal Mini-Split Evaporator Coil & Blower Fan Cleaning Kit. This reusable kit is used to clean the indoor evaporator of mini-split A/C units in areas where wall and floor protection is necessary. To order your Rectorseal Desolv Cleaning Kit click through to smart access or contact your nearest Heatcraft branch on 13 23 50.